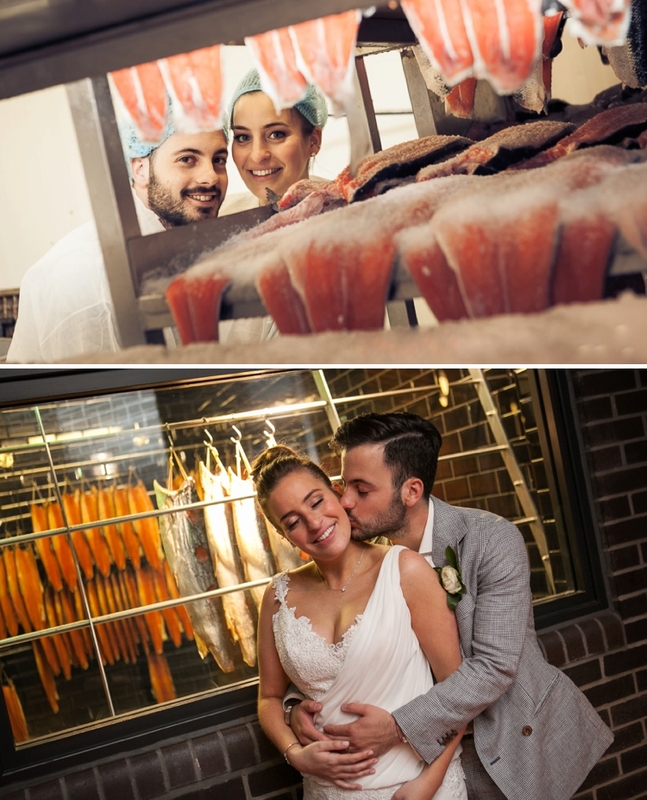 That’s what I said to myself when Smashing The Glass reader, Sarah’s à¼ber cool London wedding to Nick dropped into my inbox, so impressed was I by their unusual venue (a smoked salmon factory in London’s Olympic Park ! 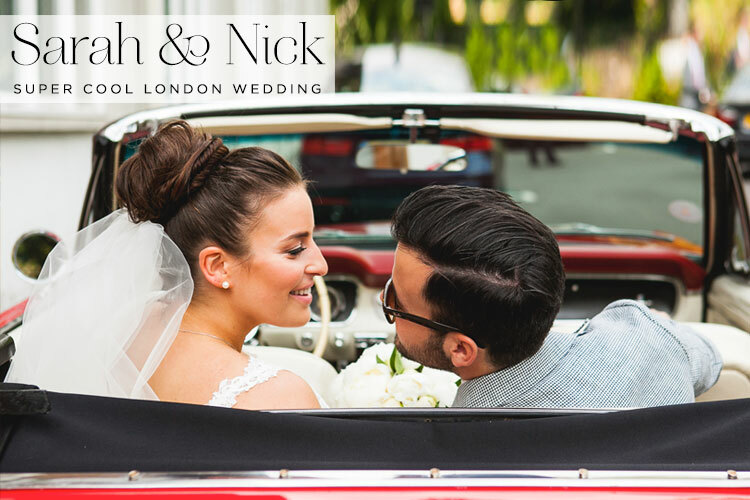 ), their teenage sweetheart love story, and their choice of wedding transport through the streets of London. 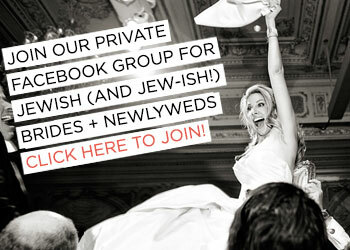 Oh yes, these two traveled from synagogue to reception in a red convertible Mustang! 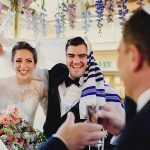 I also love the fact that Sarah and Nick invited just their very closest friends and family, and that they found their chazan (cantor), Jonny Mosesson, via the blog’s Smashing Suppliers recommended vendor list. 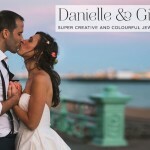 Jonny is one of the most talented people I know and to think that this blog is able to connect brides with the industry’s very best makes me a very happy bunny indeed. 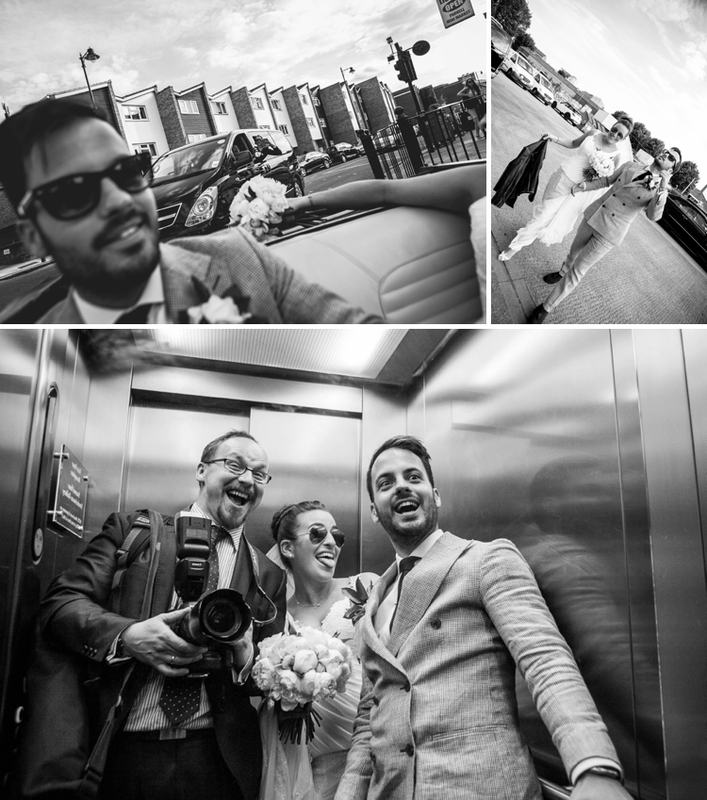 But back to Sarah and Nick — thank you for submitting your beautiful wedding and thank you to Reportage By for capturing it so wonderfully. Here’s the whole story in Sarah’s words. 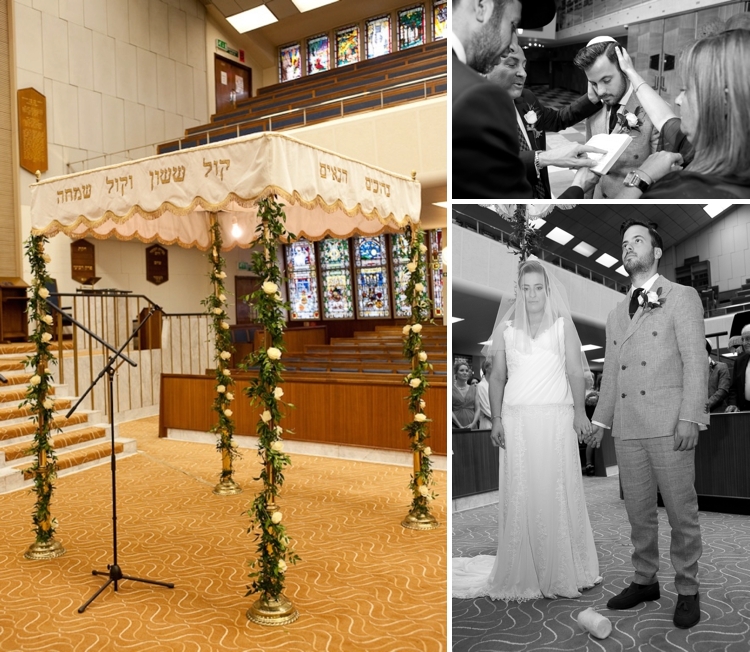 We wanted to pick a venue that hadn’t been ‘done’ before – and one that hadn’t been seen before. 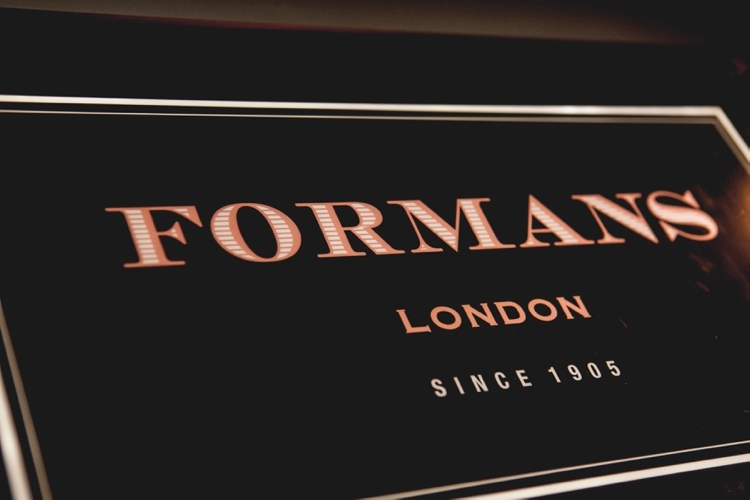 We ended up choosing a multi-million pound smoked salmon factory called Forman’s Fish Island! Nick actually HATES smoked salmon, so this didn’t have any relevance in our choice, but Forman’s salmon is the best. We went to a lot of venues, and when we arrived at Forman’s we just knew this was the one we had to choose. It was bright and airy, with huge windows overlooking the canal and the Olympic Park. The room didn’t need “dressing” it had lots of bright art on the walls which we requested to stay up. It was just what we wanted, an “open canvas”. 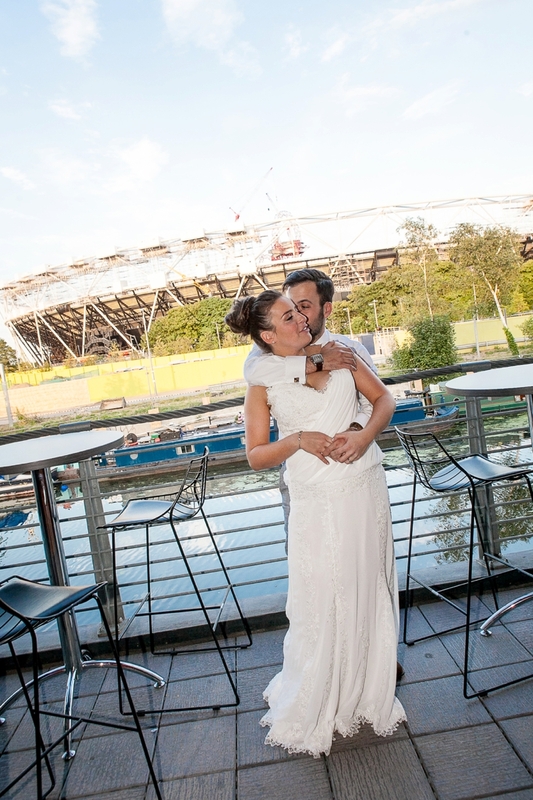 We had our reception on the roof terrace which was just perfect as the weather was amazing. We both like the colour red so when we decided on arriving at the venue in a red convertible Mustang, that was the colour we decided to carry through for our day. 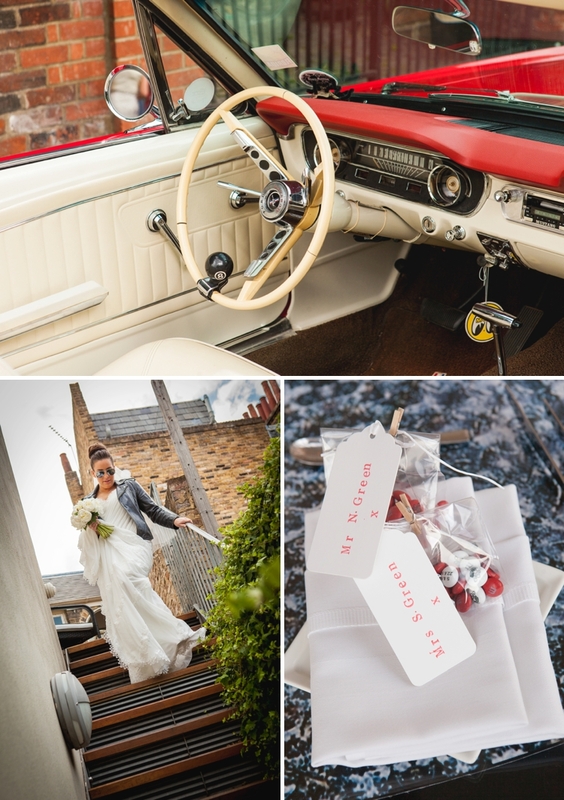 So we went for white and red invitations, red and white M & Ms, a red car, and our best men wore red ties. 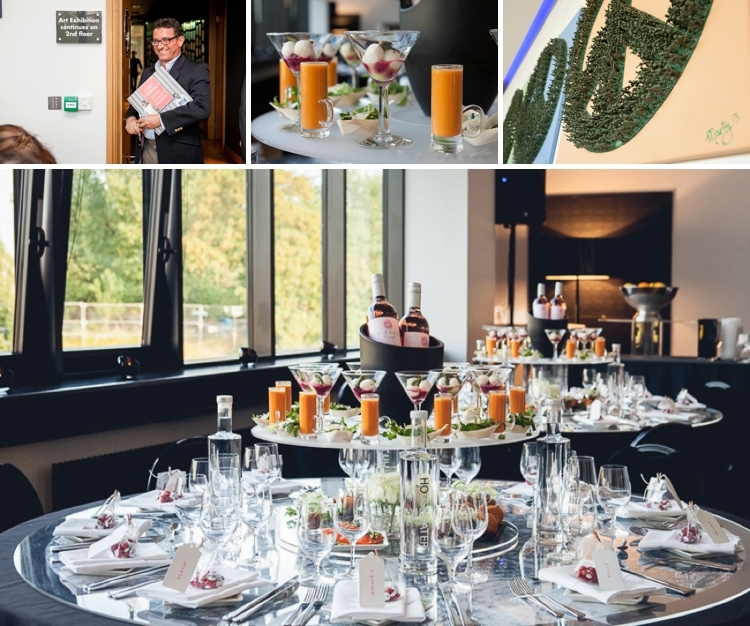 We didn’t have a planner as such, but my friends Louisa at Private Drama Events, and Jade at Fantastique London, both helped with different aspects of the planning, and they also helped with prices. Lance at Forman’s is AMAZING and he has a real eye for detail so we had nothing to worry about when it came to the venue. I actually copied an idea from the Paul Smith launch party invitation that our office had been invited to. It was on really thick triple mounted card, and there was a red slice sandwiched between. There was also a little pocket on the back for the RSVP. We used Big Day to create it. I got ready at the York & Albany boutique hotel in Regents Park, I was probably the calmest I have ever been, even my hairdresser and make up artist couldn’t believe what a laid back bride I was. I am very chilled anyway but having my mum, dad, sister, brothers, and nephews all in the room with me whilst we were getting ready was so very lovely and special. THE DRESS – NOT AN EASY RIDE! This was the worst bit for me! I hate dresses and I never wear one, so the whole experience wasn’t great. I wasn’t sure if I hated the dress or I just hated myself in it! I went with Simon (The Very Simon G) as I trust his opinion massively. I tried on a big selection of dresses, some were huge meringues, whilst some were dainty and elegant. As the thought of trying on gowns made me panic, I left dress shopping till it was really too late. This is not a good idea ladies. It just makes it more difficult if you don’t want “off the peg”. Anyway, eventually I whittled it down to two dresses, both from Pronovias Bond Street. 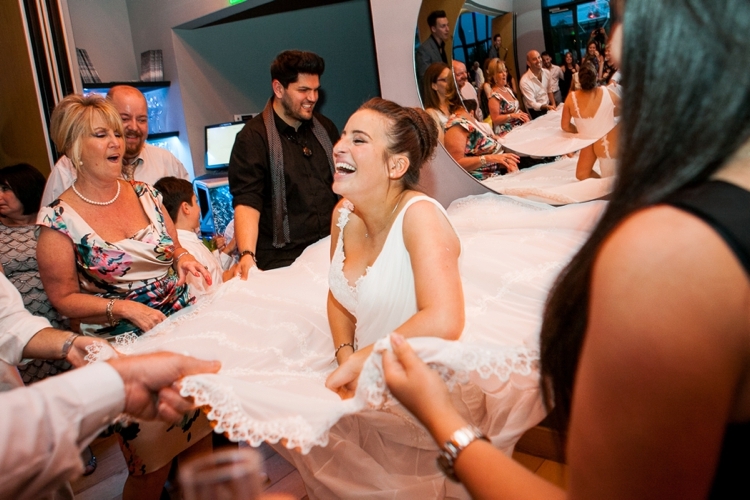 The girls in Pronovias were amazing and helped make the whole process as enjoyable as possible for me. One was a Grecian style dress with a long flowy train, whilst the other was very different. It was fishtail, with gorgeous detailing on the back, and the bottom part of the dress could be unzipped to make it a mini dress. I enlisted my mum and sister to help, and the followng week they both came with me, yet the decision wasn’t any easier. Mum said fishtail, sister said Grecian… I decided I wanted to be as “me” as possible and the fishtail was lovely but it was a bit too gimmicky. Grecian it was.. It was a HUGE relief.. I didn’t get the ” it’s the one feeling” but I did know I didn’t feel like I was in fancy dress and that was a big part in the decision. 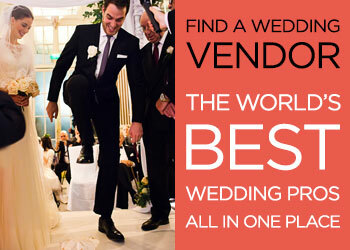 I opted for a veil that I also bought from Pronovias. 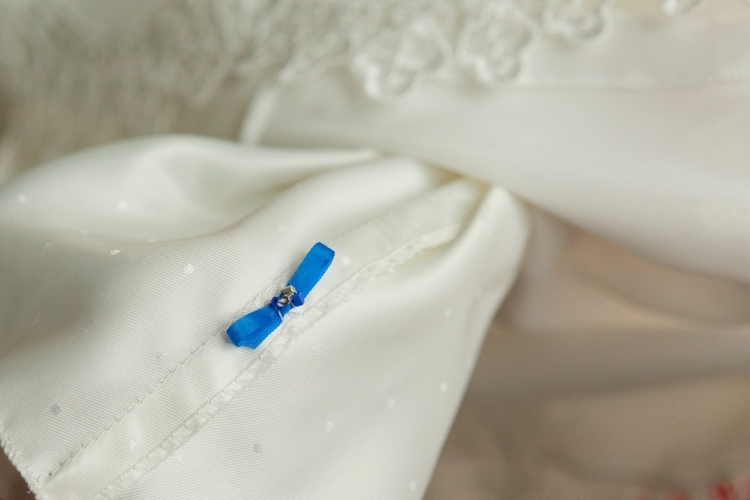 My sister who is a fashion designer had made me a little blue ribbon with a diamante to have sewn into the inner lining of my dress for my something blue, and my mum had lent me her Grandma’s diamond bracelet for my something borrowed. My something new was a necklace my mum bought for me. I love shoes, but this was also a difficult process, I didn’t want anything traditional that I could never wear again. I must have bought 7 or 8 pairs. In the end I decided on a gorgeous pair of Charlotte Olympia’s. They were very high open toe with an ankle strap and had an embellished starfish on the front. They were very comfortable, but I made a big mistake by putting them on at 1pm for the pre-photos, and then by 8pm they were killing me! Converse it was for the rest of the evening… Much more me! I am not a makeup kind of girl; a bit of mascara and I’m off. So when it came to choosing a makeup artist I wanted someone who could make me look like I wasn’t wearing any! I chose Laura Kay, she was and is incredible.. I had a trial with her first, it took about 1 and a half hours and I was so nervous but when I looked in the mirror I just knew.. She was brilliant. My mum and sister said they didn’t need to have a trial, just by looking at mine they knew she would be fantastic. For my hair, I used Suzy Bain. I used to work with Suzy and not only did I love her work; she is so great to be around — full of positive energy. My sister and mum also used Suzy. As a qualified hairdresser I knew what I wanted but Suzy did lots of options and we decided on a messy bun with a fishtail plait around it. Suzy and Laura were a great team and made us all feel so relaxed. 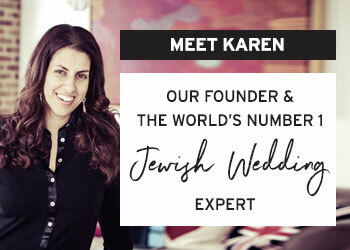 I also had a NanoKeratin hair treatment pre-wedding which I’d really recommend – it made all the difference to how my hair looked and felt. Nick knew he wanted a double breasted suit. We looked around for ages but the suits in the stores were all very wintery. We then found exactly the right suit from Suits Supply choosing blue and white hounds tooth, with linen material to stay cool. 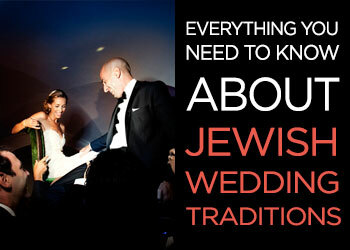 They were absolutely great to work with, and tailored it to size. We also bought knitted ties from Charles Tyrwhitt. 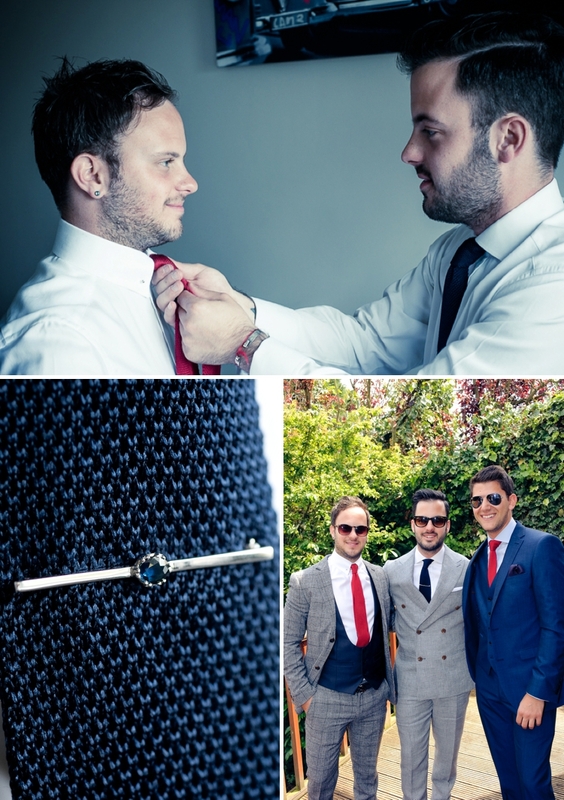 Nick wore a navy blue one, and Matt and Sam (his best men — Matt is Nick’s twin brother) wore bright red. I didn’t have bridesmaids, but my sister, Amy, was my everything. She was, and is, amazing. She was my bridesmaid, my maid of honour and most importantly my best friend! 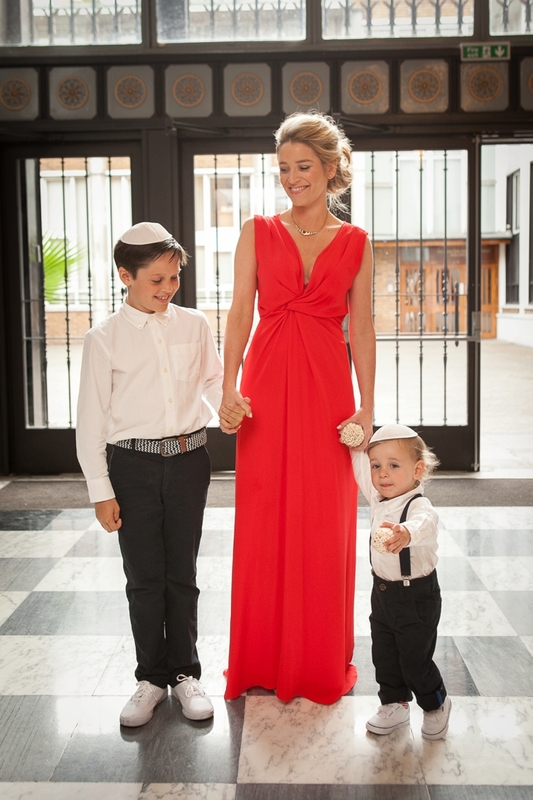 Amy wore a stunning long red dress from MaxMara. This wasn’t intentional to match our theme it just happened to be like that! The ceremony was very ‘us’. We hadn’t planned anything and to be honest we had no idea what or where we needed to be! All I knew was that I wanted to have the badeken in the aisle rather that in the room. It was important for me that the first time Nick saw me was with everyone. I was told that I wasn’t to wear any jewellery during the ceremony, but I didn’t take any notice of this. My favourite bit of the ceremony was just after Nick smashed the glass, we thought “now is the part where we kiss” well… apparently not, it was very funny. Jonny Mosesson our Chazan (who I found on Smashing The Glass) was also fantastic, and he worked really well with Ross Wall who was on keys. Black and Cook were our florists. Jackie and her team were amazing. I must have changed my mind 10 times. I really didn’t know what I wanted. 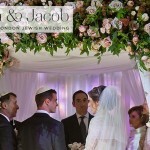 We decided on giant white roses entwined with green foliage but to have the Chuppah poles slightly visible. It was really simple but we loved it. Pinterest was really helpful too. They had lots of ideas. For my bouquet I had a mixture of open and closed peonies that smelt amazing. 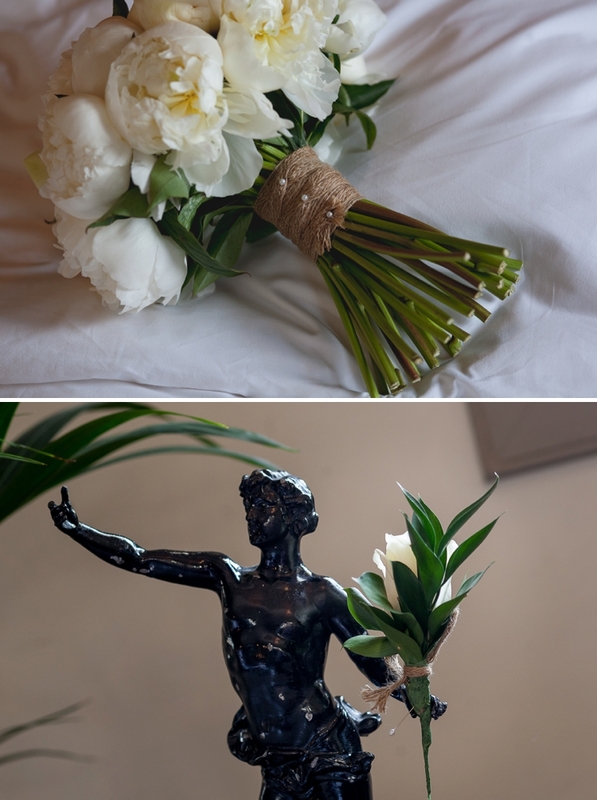 I didn’t want any ribbon to tie my bouquet – instead I bought some delicate rope and Black and Cook used white pearl pins to hold it together. Button holes were white roses also with the rope ties. Centre pieces were white roses in shallow round bowls that were sat inside a lazy susan. We saw a few photographers but we opted for Reportage By. Krystian was great and he made us feel really at ease. We left him to it and just asked for as natural as possible. Reportage has photographed many of our friends and we love their style. We had a pre shoot at the venue which was really fun. We both have a really sweet tooth. 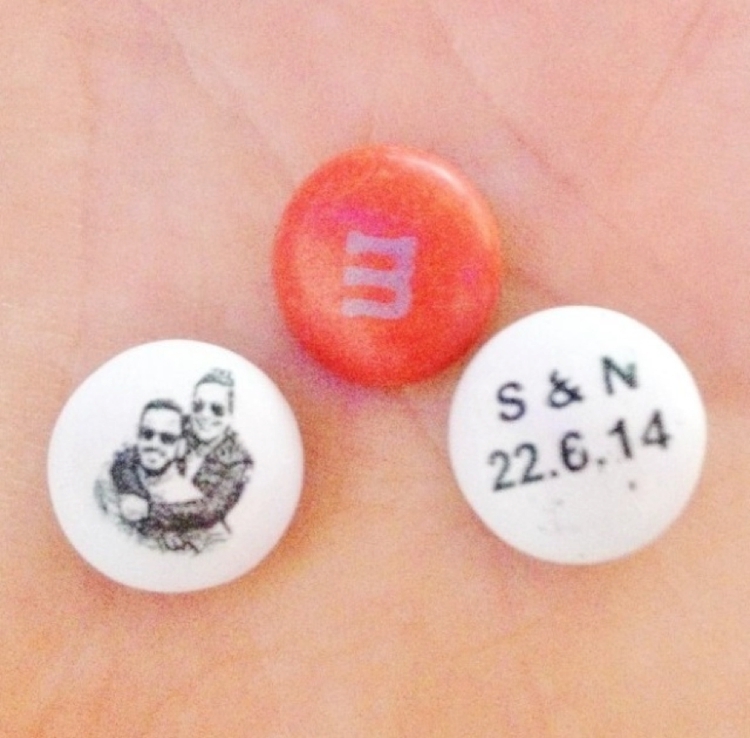 Nick bought me personalised M & M’s a couple of birthdays ago and I knew that for our wedding we just had to have them. We chose red and white with our wedding date on one and our picture on the other. 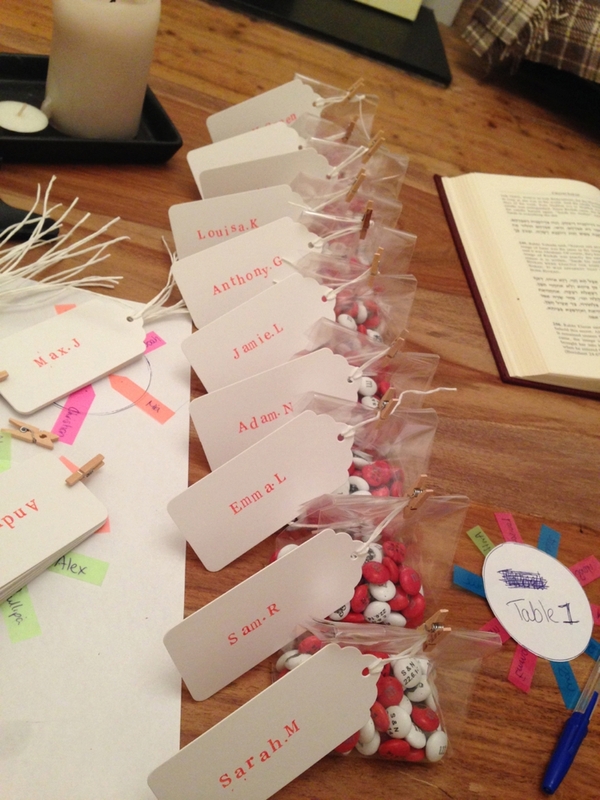 I made the place cards with individual letter stamps and then bagged the M & M’s to double up on name cards and favours. We had Creation DJ-Live for our music who are a DJ live set. 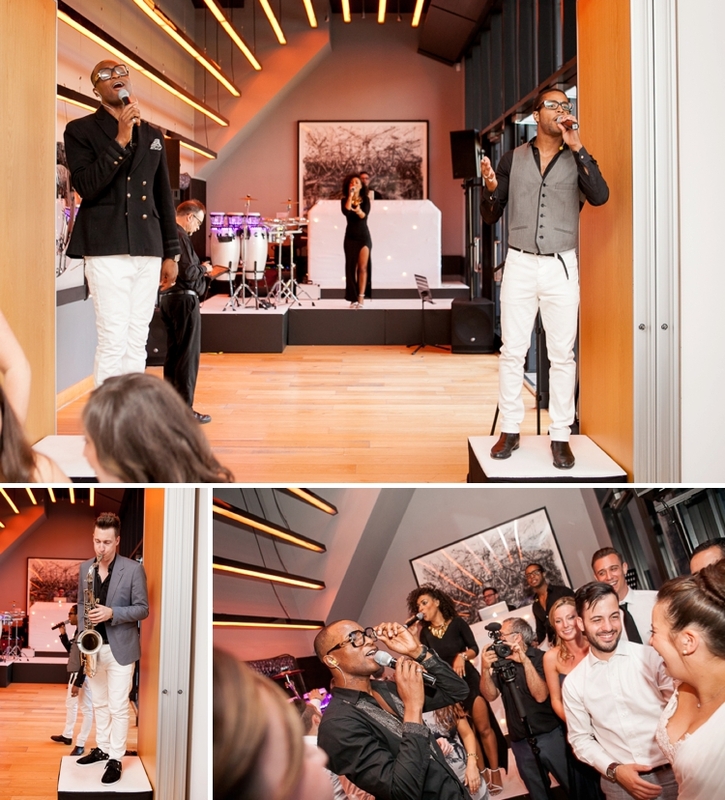 We provided a list of songs we liked and definite no’s but left the rest up to them, Jason, our DJ, was actually a friend of ours so he knew what we wanted and he made the night extra special. 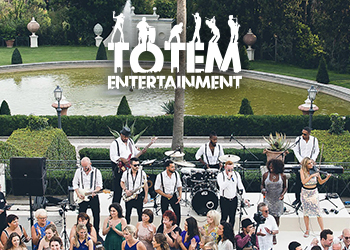 Our first dance was HeyHo by The Lumineers – we wanted an upbeat song. I wasn’t sure if I wanted to spend money on a wedding video but the day went by so fast, I’m really glad we did. We used Hint of Mint videographers. 1. 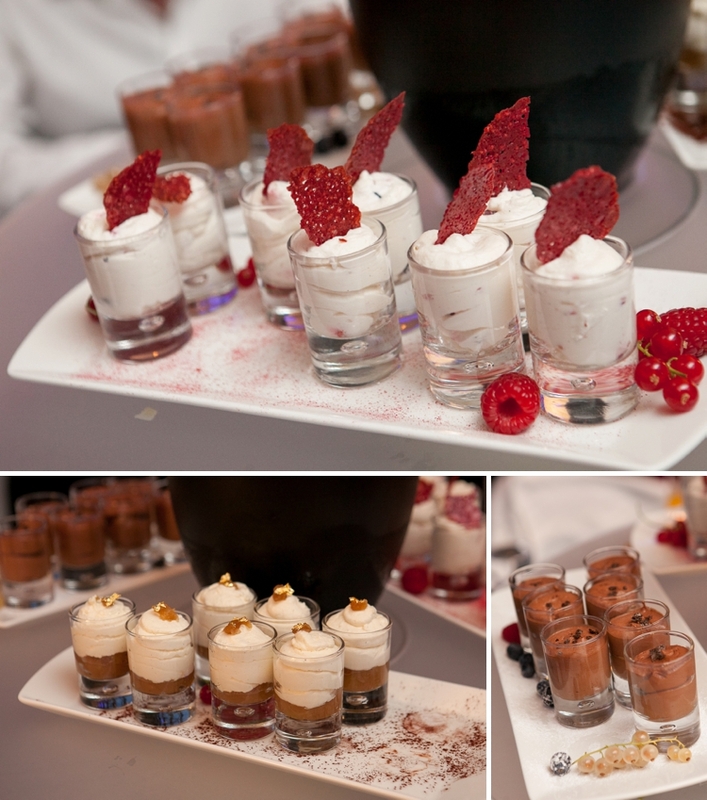 Make sure your husband eats before he drinks, the excitement makes the alcohol much stronger! 2. Don’t let anyone else make you change your mind. If you know what you want, go for it! There will likely be one person in particular reading this blog who will know what I mean, and I am still to this day so upset with the situation and wish it didn’t happen. Would have loved to work with you! What a fabulous couple! 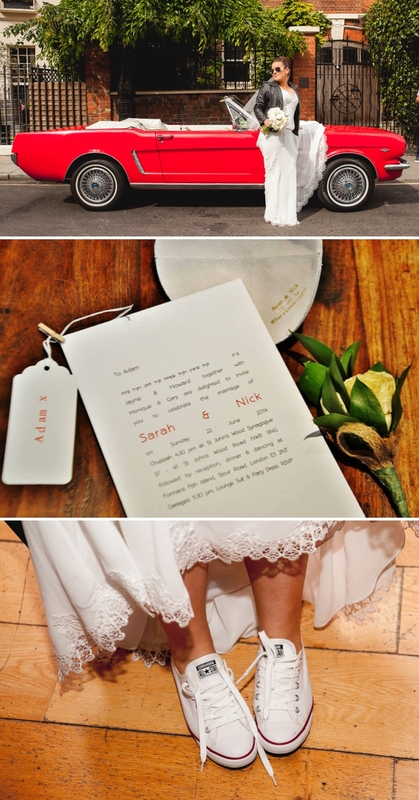 The bride was beautiful, the dress from maxmara is gorgeous, and they had fabulous stationery!!! Congratulations to the new Mr and Mrs!!!! 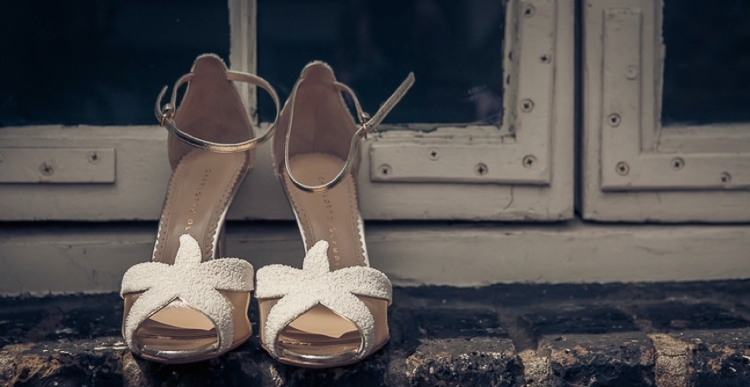 LOVE this bride’s style! 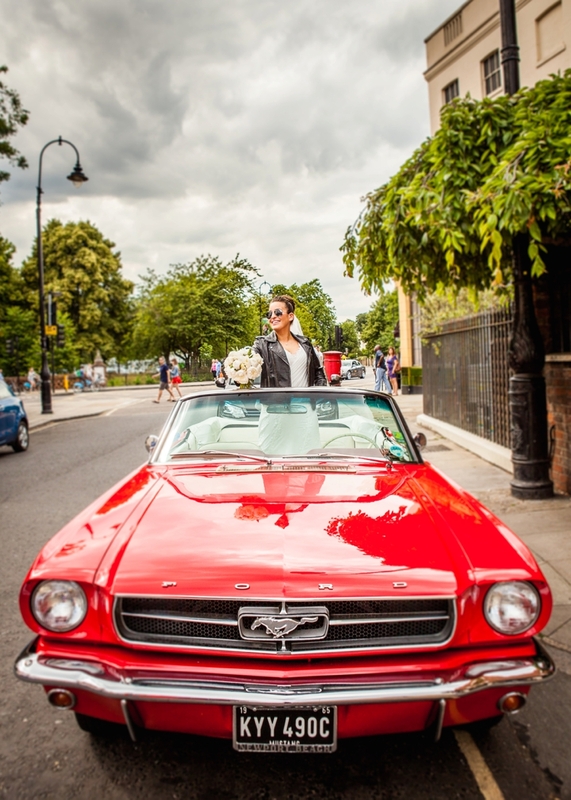 Leather jacket and classic sports car – awesome!!!!! I actually had to do a double take when I realised this is a UK wedding! Very cool and beautifully captured. 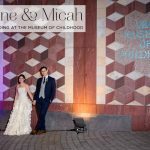 Love everything that is modern and everything that is traditional about this wedding!So refreshing to see a couple do their own thing for their wedding! Wow Wow Wow what a post…. This wedding looked so natural as do the gorgeous couple. That venue looks incredible and so different. Thanks for your lovely comment Michelle. 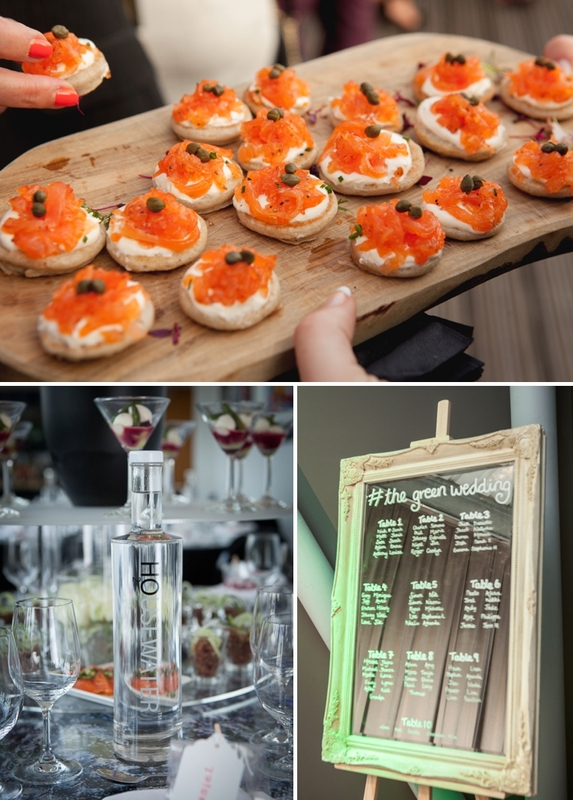 I love this wedding too and a smoked salmon factory has to be one of the most unusual venues I’m yet to feature on STG! love the idea of the leather jacket and raybans! Me too… and Sarah absolutely ROCKS that look! Are you planning your wedding at the mo, Jade? 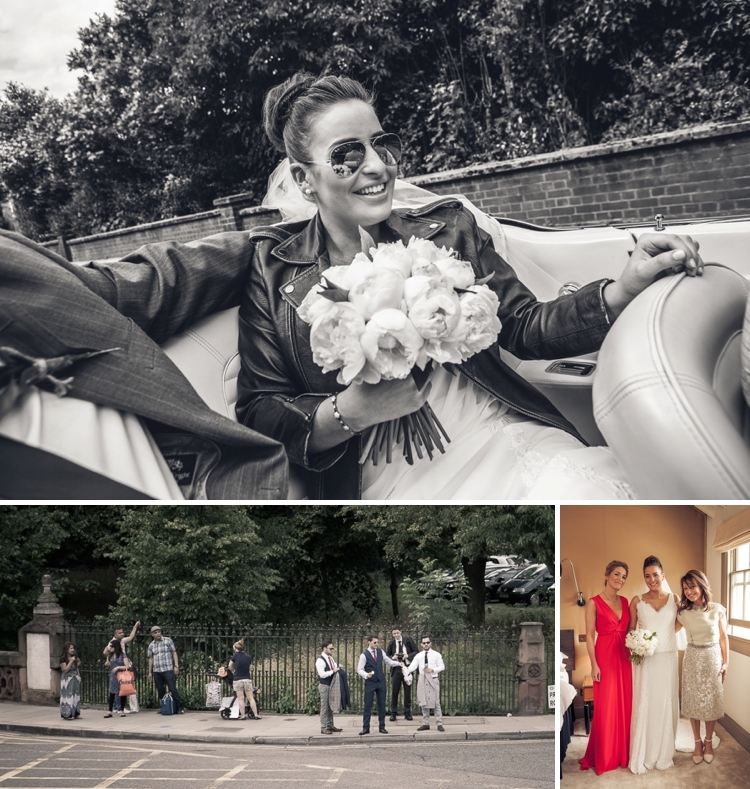 Lovely wedding and some great shots. Everyone looked amazing and looked like they had a great time. 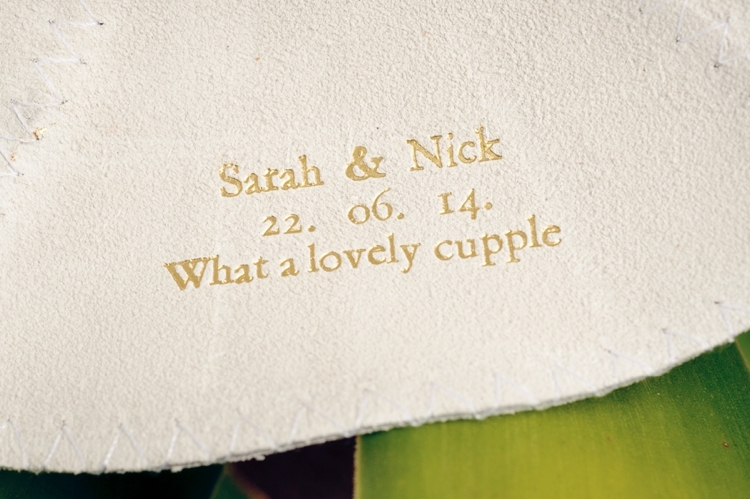 Congratulations to Sarah and Nick and all the best to them in the future.